In France there are 16 recommended hiking loops in the Morteau Valley (at altitudes ranging from 700 to 1300 meters), from 1.5 to 6 hours’ duration. The “Sur la Roche” Inn is situated on the GTJ (Great Jura Traverse) and the GR5. Only 1 km away, in Switzerland, a network of hiking trails link the villages of the Neuchatel District (more than 1000 kms of marked trails). 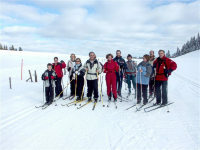 The “Sur la Roche” Inn is situated on the GTJ link between Villers le Lac and Les Gras. There is access to 5 marked biking loops (from 11 to 32 kms) on the French side of the border. Just on the other side of the border, in Switzerland, 11 biking trips are available for all levels (from 9 to 30 kms). 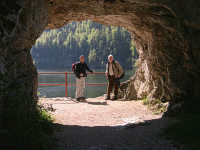 An easy trip is possible in the "Doubs Basin" from a starting point called "Chaillexon" with on-site rentals. webcam of the Mont Meusy : click here. The Nordic Zone stretches from the border to the high crests of the Swiss Jura Mountains, representing 170 kms of marked and tracked cross-country ski trails. The Inn is situated at the beginning of the GTJ (180 kms north to south along the Jura Mountains); skating and classic. 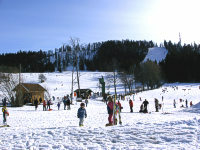 Night-skiing is available in the village of Chauffaud. 60 kms of "Franco-Suisse" marked trails. An initiation trail to orienteering. Several GPS trails departing from the Inn. The family ski area "Meix Musy "is situated 1km from the Inn (5 ski lifts and 1 tow rope). Ski lessons available (private or group). 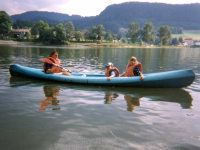 Weather permitting (low temperature), it is possible to skate on the Doubs Basins (on the French side) or on Lake Tailléres (on the Swiss side). This website talks about climbing vie ferrate in Doubs, Franche Comté and France. A shop where you can find in pontarlier all the equipment and stuff for your sport activities.